Abbott, S. ve McConkey, R. (2006). The barriers to social inclusion as perceived by people with intellectual disabilities. Journal of Intellectual Disabilities, 10(3), 275-287. Ayres, K.M. ve Langone, J. (2008). Video Supports for Teaching Students with Developmental Disabilities and Autism: Twenty-Five Years of Research and Development. Journal of Special Education Technology, 23(3), 1-8. Bellini, S. ve Akullian, J. (2007). A meta-analysis of video modeling and video self-modeling interventions for children and adolescents with autism spectrum disorders. Exceptional Children, 73(3), 264- 287. Brown, A.L. (1992). Design experiments: Theoretical and methodological challenges in creating complex interventions in classroom settings. Journal of the Learning Sciences, 2(2), 141-178. Brown, I., Percy, M. ve Machalek, K. (2007). Education for individuals with intellectual and developmental disabilities. I. Brown, M. Percy ve H. Paul (Ed. ), Comprehensive guide to intellectual & developmental disabilities içinde (s.489-510). Baltimore, Maryland: Brookes Publishing Co.
Cavkaytar, A. (1998). Zihin engellilere öz bakım ve ev içi becerilerinin öğretiminde bir aile programının etkililiği. Yayınlanmamış Doktora Tezi, Anadolu Üniversitesi, Sosyal Bilimler Enstitüsü, Eskişehir. Cavkaytar, A. (2005). Özel gereksinimi olan çocuklara özbakım ve ev içi becerilerinin öğretimi: uygulamalı el kitabı. Ankara: Gündüz Eğitim ve Yayıncılık. Charlop-Christy, M.H., Le, L. ve Freeman, K.A. (2000). A comparison of video modeling with in vivo modeling for teaching children with autism. Journal of Autism and Developmental Disorders, 30(6), 537-552. Charlop-Christy, M.H. ve Daneshvar, S. (2003). Using video modeling to teach perspective taking to children with autism. Journal of Positive Behavior Interventions, 5, 12-21. Cloth, A.H. (2006). Navigation efficacy among parents of public school Children with special needs. Yayınlanmamış Doktora Tezi, Faculty of the Graduate School of the University of Texas at Austin. Cobb, P. (2001). Supporting the improvement of learning and teaching in social and institutional contex. S. Carver ve D. Klahr (Ed. ), Cognition and instruction: Twenty-five years of progress içinde (s:455–478). Cambridge, MA: Lawrence Erlbaum Associates. Cooper, J.O., Heron, T.E. ve Heward, W.L. (2007). Applied behavior analysis (2nd ed.). Upper Saddle River, NJ: Pearson Prentice Hall. Creswell, J.W. (2005). Educational research: planning, cunducting, and evaluating quantitative and qualitative research. New Jersey: Pearson Prentice Hall. Gooden-Ledbetter, M.J., Cole, M.T., Maher, J.K. ve Condeluci, A. (2007). Self-efficacy and interdependence as predictors of life satisfaction for people with disabilities: Implications for independent living programs. Journal of Vocational Rehabilitation, 27(3), 153–161. Hall, S.A. (2010). The social inclusion of young adults with intellectual disabilities: a phenomenology of their experiences. Yayınlanmamış Doktora Tezi, Faculty of The Graduate College at the University of Nebraska. Hallahan, D.P., Lloyd, J.W., Kauffman, J.M., Weiss, M.P. ve Martinez, E.A. (2004). Learning disabilities: Foundations, characteristics, and effective teaching (3rd ed.). Boston: Allyn & Bacon. Hine, J.F. ve Wolery, M. (2006). Using point-of-view video modeling to teach play to preschoolers with autism. Topics in Early Childhood Special Education, 26, 83-93. Judge, S. ve Simms, K.A. (2009). Assistive technology training at the pre-service level: A national snapshot of teacher preparation programs. Teacher Education and Special Education, 32(1), 33-44. Keenan, M., Henderson, M., Kerr, K.P. ve Dillenburger, K. (2006). Applied behaviour analysis and autism: building a future together. London: Jessica Kingsley Publishers. Kim, K.H. ve Morningstar, M.E. (2005). Transition planning involving culturally and linguistically diverse families. Career Development for Exceptional Individuals, 28(2), 92-103. Kuzu, A., Cankaya, S. ve Misirli, Z.A. (2011). Design-Based Research and Its Implementation in the Design and Development of Learning Environments. 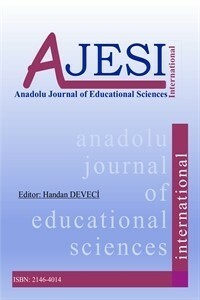 Anadolu Journal of Educational Sciences International, 1(1), 19-35. McConkey, R., Walsh-Gallagher, D. ve Sinclair, M. (2005). Social inclusion of people with intellectual disabilities: The impact of place of residence. Irish Journal of Psychological Medicine, 22(1), 10- 14. Özen, A. (2009). Davranış değiştirme ve öğrenim sürecinde aile. E. Tekin İftar (Ed. ), Davranış ve öğrenme sorunu olan çocukların eğitimi içinde (s.63-82), Eskişehir: Anadolu Üniversitesi Yayını. Parsons, S., Daniels, H., Porter, J. ve Robertson, C. (2008). Resources, staff beliefs and organizational culture: factors in the use of information and communication technology for adults with intellectual disabilities. Journal of Applied Research in Intellectual Disabilities, 21(1), 19-33. Paterson, C.R. ve Arco, L. (2007). Using video modeling for generalizing toy play in children with autism. Behavior Modification, 31, 660-681. Schreck, K. ve Mazur, A. (2008). Behavior analyst use of and beliefs in treatments for people with autism. Behavioral Interventions, 23(3), 201-212. Shukla-Mehta, S., Miller, T. ve Callahan, K.J. (2010). Evaluating the effectiveness of video instruction on social and communication skills training for children with autism spectrum disorders: a review of the literature. Focus on Autism and Other Developmental Disabilities, 25(1), 23-36. Vaden-Kiernan, N. ve McManus, J. (2005). Parent and family involvement in education: 2002–03. Washington, DC: Institute of Education Sciences U.S. Department of Education. Welches, P. ve Pica, M. (2005). Functional analysis of behavior: A collaborative phenomenological approach. The Humanistic Psychologist, 33(1), 59-68. Wistow, R. ve Schneider, J. (2003). Users’ views on supported employment and social inclusion: A qualitative study of 30 people in work. British Journal of Learning Disabilities, 31(4), 128-135. Woodward, J. ve Rieth, H. (1997). A historical review of technology research in special education. Review of Educational Research, 67, 503-536. Wu, P.F. (2011). The Effects of Video Prompting and Activity Schedules on The Acquisition of Independent Living Skills of Students Who Are Deaf and Have Developmental Disabilities. Yayınlanmamış Yüksek Lisans Tezi, Graduate School of The Ohio State University. ISNAD Kuzu, Abdullah , Cavkaytar, Atilla , Çankaya, Serkan , Öncül, Nuray . "Zihin Engelli Bireylerin Ebeveynlerinin Kullanımına Yönelik Geliştirilen Mobil Beceri Öğretimi Yazılımına Yönelik Katılımcı Görüşleri". Anadolu Journal Of Educational Sciences International 3 / 2 (December 2013): -.